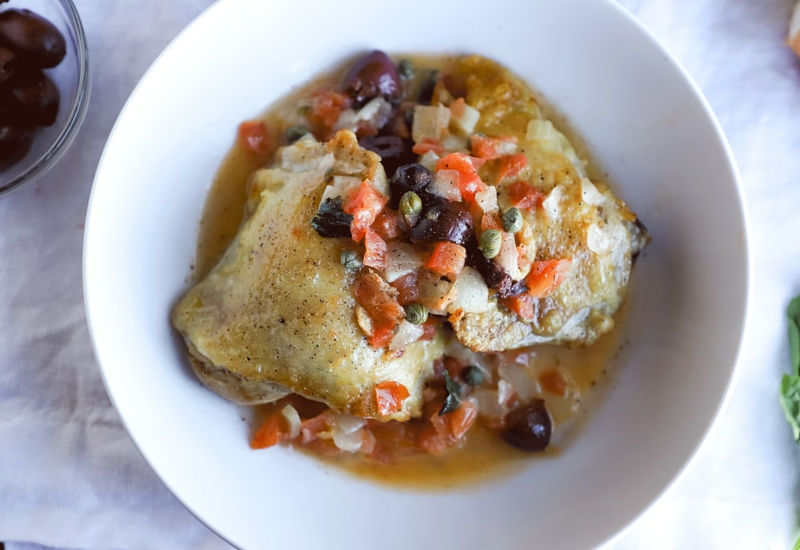 Chicken Provençal is a classic dish of the French countryside. This one-pot pressure cooker recipe takes its inspiration from the French dish, turning it into a quick and easy dinner you can make at home for a delicious weeknight dinner from fresh ingredients and pantry staples. The end result is tender chicken with a flavorful sauce. Be sure to have some thick pieces of crusty bread ready for dipping in the garlicky sauce. Sauté onion in hot oil until softened and translucent, about 3 minutes; add garlic and cook until fragrant, about 30 seconds more. Stir chicken with the vegetables and cook until lightly browned, 6 to 7 minutes. Pour white wine into pan to deglaze, scraping browned bits of food from the pan with a flat-edged utensil; add tomatoes and stir. Stir olives, capers, and basil with the chicken mixture. Place a chicken thigh onto each plate. Spoon tomato sauce mixture over the chicken. Be sure to let the chicken sear without disturbing it. The more golden-brown the color, the better your pan sauce will be in the end. Remember, you can always add more garlic, but you cannot add less once it's in there. If you really like your chicken garlicky, gradually increase the amount each time you make this until you hit your personal sweet spot. Per Serving: 418 calories; 28g fat; 9.3g carbohydrates; 32g protein; 166mg cholesterol; 786mg sodium. I have to have lots of garlic on my food, that's how much I love it. I used about 3 teaspoons instead of 2, which was more than enough for most people. I used boneless chicken thighs and canned tomatoes because it's convenient. This recipe was very well done and is served best over a bed of pasta. I made a cream sauce instead of the white wine sauce and left out the olives. I thought it was really good, but definitely heavier than the wine sauce would have been. Delicious either way. Amazing sauce, lots of flavor. Made mine with chicken breast instead of thighs and paired it with creamy risotto. Not exactly French and not exactly Italian, just really good food. Delicious! So tasty! I don’t have a pressure cooker but used my Nutri Stahl pot, so process was a little different but the net result was still the same! I could eat this everyday! A pity we can’t add a photo! We loved this! I used chicken breasts (boneless, skinless). Sooo, I botched up the steps and put the tomatoes in at the same time I put in the chicken. After realizing my mistake, and knowing that I wanted to cook the chicken breasts for less time than I would thighs, I skipped the 6 minute sauté and went straight to the 12 minute pressure cook. Then, I allowed a 5 minute natural release before serving. The result was more of a super tender poached chicken in a delicious briny soup!